The Armadale Serviced Apartments Melbourne provides both business and leisure travellers to Melbourne with discount 1 and 2 bedroom apartment accommodation in a central location. These affordable serviced apartments are perfect for family holidays, relocations and corporate business people looking for fully self contained accommodation on a budget. By choosing to stay at the Armadale Serviced Apartments you will be ideally located within close proximity to the popular Chapel Street in Prahran, which has a vibrant atmosphere filled with fashion boutiques, discount shops, fine dining restaurants, nightlife entertainment and cosmopolitan sidewalk cafes. The Armadale Serviced Apartments also has excellent access to the Melbourne CBD, Southbank, St Kilda Road business district and St Kilda beach via Melbourne's famous trams. Guests staying at this cheap accommodation will be able to experience the antique shops and trendy restaurants on High Street Armadale, which are only 1 kilometre away. 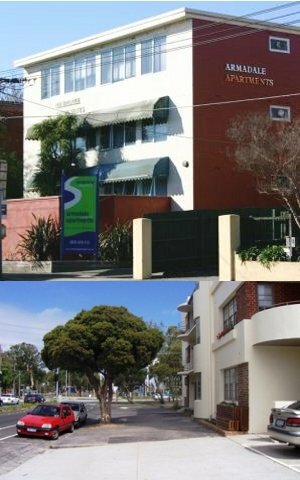 Also the cosmopolitan Acland and Fitzroy Streets in St Kilda can be easily accessed from this affordable property. 1 Bedroom Apartment - This quality serviced apartment has either Queen or 2 Single beds and also features a private ensuite bathroom, air-conditioning, broadband internet access, living area, DVD player, fully equipped kitchen, phone, alarm clock, ironing facilities, complimentary off street car parking and is just a short walk to public transport, shops and cafes. 2 Bedroom Apartment - This spacious serviced apartment has 1 Queen and 2 Single beds as well as an extra single sofa bed in the separate lounge room. The apartment also features a fully equipped kitchen, air-conditioning, heating, broadband internet access, phone, ironing facilities, laundry facilities, complimentary off street car parking, DVD player, full size family bathroom and is close to public transport to the city.